Onyx Caverns is a medium-sized cave east of Leyawiin containing bandits. 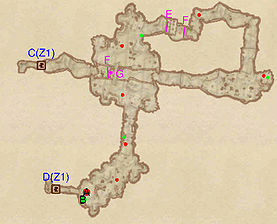 It contains two zones: Onyx Caverns and Onyx Canyon Bridge. This cave contains 69 Cairn Bolete plants and 56 Wisp Stalk plants. 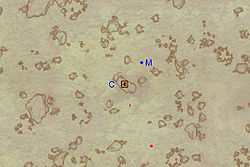 This location's map marker (M on map) is named Onyx Caverns (editor name OnyxCavernsMapMarker). The entrance door is SW of the marker, 50 feet away. Upon entering the zone, you will come across a raised rock wall on your left at G. This functions as a convenient escape route from the next zone, so proceed into the first chamber, which contains a barrel of torches and nothing else. Proceed forward, kill the opposition then loot the chest in the northern chamber. 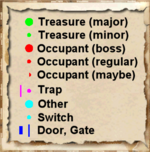 Head into the large chamber to the east, but watch out for the Pressure Plate (E) triggering the Swinging Mace trap at F. The chamber is fairly empty except for a chest in the northeastern corner. Kill the Archer Bandit guarding the southern tunnel, enter the next room and claim the minor loot from the chest near the bedroll at b. The next long hallway is safe, but the upcoming chamber contains an archer Bandit. The little opening on the northern wall holds a chest, but beware of another pressure plate at E. The western tunnel leads to the final chamber, which contains a small camp complete with four bedrolls (b), food and wine. The wooden door at D leads to the next zone, Onyx Canyon Bridge. When you return to this zone via door C, activate the Turn Handle (cyan dot on map), watch the rock wall at G disappear, providing easy access to the entrance at Out. Immediately upon entering from door D you will encounter a boss-leveled bandit at A, guarding the boss chest at B. Proceed into the next chamber, looting the chest along the way. 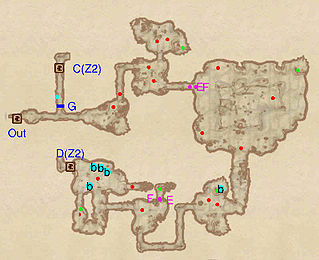 Cross the narrow bridge over the gap, loot the locked chest and proceed down the eastern tunnel, avoiding the Falling Logs (E) triggered by the Tripwire at F. Follow the tunnel to the next chamber where another Bandit will be waiting. Eliminate him and grab the chest in the southeast corner. Head west into the misty tunnel and beware of the hard-to-spot tripwire (F), which will trigger a swinging log trap at E. Climb the incline and enter door C leading back to Onyx Caverns. This page was last modified on 25 March 2018, at 03:08.